Please note that the content of this book primarily consists of articles available from Wikipedia or other free sources online. 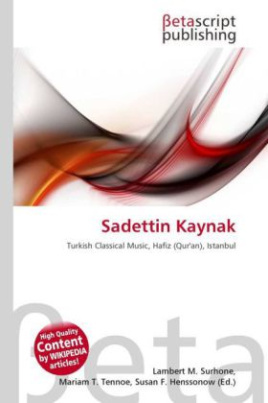 Sadettin Kaynak (1895 1961) was a prominent composer of Turkish classical music.Born in Istanbul, he became a hafiz at a young age. He completed his music education at the Istanbul University. Later, he traveled to south east Anatolia and researched Turkish folk music there. He lived through the ban on Turkish music during Atatürk''s time, but still remained a well known composer writing music for poetry and movies from Egypt. He had a stroke in 1955, and lived paralyzed until his death in February 3, 1961.